It was the best fish of the day, easily 16 inches and full of fight. He had smashed the gully fish fly that I had cast from the rapids below his small pool and he was now turning cartwheels across the surface of the water. As I stepped upstream to get better leverage and to be in a position to bring the acrobat to hand, he decided that his best defense was a good offense and, quick as a wink, turned and shot straight at me. Before I could react (though I’m not sure what I would have done) he flew between my legs, took a hard right, and left the gully stuck in my pants leg as he continued, unfettered, downstream. In soccer terms, I’d been megged. Spring. The time when a young man’s fancy turns to thoughts of the L-word. Largemouths. 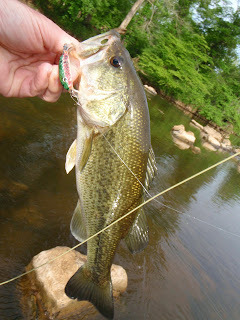 And the very best of largemouth fishing is doing it topwater. Now I have caught some pretty nice fish dragging heavy flys along the bottom of waterways this year, but it’s not my style. I like fishing the top few inches of the water column, watching fish sneak up on the fly or kamikaze ambush it from some hiding place, seeing and hearing the strike, not having to wonder if a bump was a fish or a hangup. Stumps don’t splash, largemouths do. 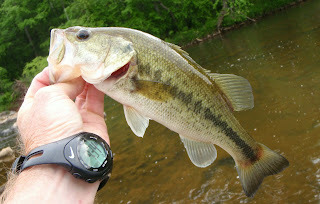 I returned to my out of the way places on the Haw after spending a few weeks focused downstream on white bass. The whites are probably finishing up and I was ready to get back to pursuing my favorite bass in my favorite places. Besides, it was Saturday, a day I usually avoid fishing, and the fisherman would have been thick as blackflies around Robeson Creek and the highway 64 bridge. Where I was, I saw only a couple of kayakers pass by, over on the wider braid, all morning. It was good to be back on more familiar water, chasing largemouths who were looking up again, striking bugs and chasing baitfish near the surface. The water level was absolutely perfect and a gentle evening rain had stained the water ever so slightly, making the fish more comfortable in their stealth but not significantly impacting my ability to see where I was stepping. And it was great to be wet wading again, walking the water with just a pair of quick drying technical pants. Now I like my waders, but I am very happy not to mess with them. I was somewhat apprehensive to be cold wet for first time this year, but the water was a comfortable 71 degrees, the same as the air, and it was refreshing from the outset, even at 7:30 in the morning. I must admit, though, that a shiver did run up my spine the first time the boys got dipped, but that happens even in the height of summer. Best of all, the bass were active. Armed with my favorite 6wt and an Orvis gully fish fly, I caught 8 fish in a couple of hours, nothing big, cookie cutter 10-12 inchers, all beautifully marked, all full of spring vigor. I also hooked and long line released half a dozen more, including the afore mentioned through the wicket rocket. The only hiccup was my nice early start, made earlier by an alarm clock malfunction. The evening before I had set it for 6:00am and when it went off I quickly stopped it and quietly crawled from bed, trying hard not to awaken Mary. (I suspect I was not successful in that, but she had the good grace to let me think I had.) I dressed in the dark, slipped to the kitchen for a snack, did a quick email check, and began to wonder where the sun was. The kitchen clock said 5:30. I hate alarm clocks, especially malfunctioning ones, but it got me on the river at dawn and I got a couple good hours fishing in before the rest of the day got started, so I’ll let it slide this time. And if you have to get up too early for something, it might just as well be for fishing, don’t you think?